It’s a new year and we’re ready to kick things off in a big way! 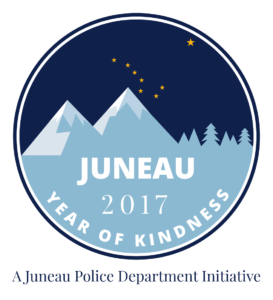 Random Acts is pleased to announce a partnership with the city of Juneau, Alaska for 2017, during which our team will be helping spread the word about and support the city’s “Year of Kindness” initiative. Throughout the year, the Juneau Police Department will be carrying out random acts of kindness across the city, in order to measure the impact that generosity has on its corner of the world. Here’s how that works: Each week, a unique Juneau-based organization or group will collaborate on a sizable “kindness event” for others in the community. Together, the department and community members will work to effect some sort of positive change for others — and together, they’re hoping to inspire others to do some good as well. The Year of Kindness campaign is already off to a healthy start, too: Getting ahead of things last month, a group of special education students from Juneau-Douglas High School, for example, handed out candy canes to fellow students at neighboring Thunder Mountain High School, where a senior year student had passed away months earlier from an accidental firearm injury, according to the Portland Press Herald. In addition to the random acts of kindness the city and its police department will be carrying out throughout the year, Random Acts’ own development manager, Jennifer Willis-Rivera, will be visiting the city early this year and again in January 2018 to check up on the progress and see how all that kindness has affected its residents. You can track the campaign’s progress here on our official Juneau Year of Kindness site over the next 12 months — and if you or someone you know lives in Juneau and wants to get involved in a more hands-on capacity, check out the police department’s official Facebook page here and ask away! Juneau and Random Acts are ready to get kind in 2017. Take the challenge in your own community and join in on the fun!